What's with Newt Gingrich and Agenda 21? (CNN) - If you weren't listening closely to Newt Gingrich at the last GOP debate, you might have missed it. "I would adopt a very strong policy towards the United Nations of dramatically taking on its absurdities," the former House Speaker said. "I would explicitly repudiate what Obama has done on Agenda 21 as the kind of interference from the United Nations," he then added. Did you catch that? Agenda 21. What exactly is Agenda 21? The United Nations adopted Agenda 21 as part of a global initiative to combat climate change at the 1992 Earth Summit in Brazil. According to the U.N.'s website, "Agenda 21 is a comprehensive plan of action to be taken globally, nationally and locally by organizations of the United Nations System, Governments, and Major Groups in every area in which human impacts on the environment." Even though the U.S. government is not legally bound by the initiative, local governments across the country have implemented some of its strategies for sustainable development. Smart growth, transportation planning, and limited rural development are all Agenda 21 goals. But some tea party groups see the potential for abuse. Conservative activists have petitioned local governments to scrap their Agenda 21 plans out of fear the initiative could one day interfere with personal property rights. Fears of Agenda 21 cropped up at a meeting of the Carroll County Board of Commissioners in Maryland in August. "Everywhere I go today people, particularly in the tea party, are very worried about Agenda 21," Gingrich told a tea party crowd in July. "It's part of a general problem of the United Nations and other international bureaucracies that are seeking to create an extra constitutional control over us. And I reject that model totally," he added. The former speaker's comments are posted on his YouTube page. He tweeted out a link to the video after Saturday's South Carolina debate, co-sponsored by CBS News and National Journal. 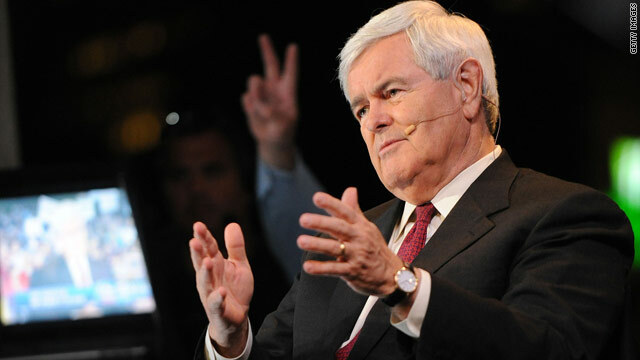 Gingrich warned the crowd Agenda 21 could potentially be used to seize the private property of American citizens. "It's a United Nations proposal to create a series of centralized planning provisions where your local city government can't do something because of some agreement they signed with some private group who are all committed to taking control of your private property and turning it into a publicly controlled property," Gingrich said. The rising GOP contender promised another tea party crowd in September he would take quick action to block the initiative if he's elected president: "That's probably going to be one of the first executive orders and that is to cease all funding for any kind of activity for United Nations Agenda 21." But Agenda 21 detractors have critics of their own. Phil Stoddard, mayor of the tiny city of South Miami in Florida, says Gingrich is playing on conservative fears. "I think they're out of their minds," Stoddard said. A passionate believer in the threat of climate change, Stoddard said his city adopted Agenda 21 to ease traffic congestion and cut down on pollution. Stoddard added local governments also learn from one another based on the results of Agenda 21-inspired smart growth initiatives. "This is just a way for us to share information to combat climate change and promote sustainable development," Stoddard said. On the campaign trail in Iowa earlier in the week, Gingrich acknowledged to reporters Agenda 21 is not legally binding. "It is part of a treaty that has never been endorsed by the (U.S.) Senate and I don't think the federal government should be in the process of implementing something that the Senate has not approved," he said. "Because it's being implemented at the local level," Gingrich responded. Climate change is a touchy subject for Gingrich. In 2008, he appeared in an ad with then-House Speaker Nancy Pelosi to deliver a call for national action to combat global warming. In his run for the GOP presidential nomination, Gingrich has told reporters the ad was a mistake. I live in Carroll County, Maryland. The commissioner who is pushing the Anti-Agenda 21 movement (which we refer to as "Plan 9 from Outer Space") is a real estate developer who wants to turn Carroll into another north New Jersey. He recently used county funds to put on a global warming denier conference that featured a land use consultant from south Florida and a public transportation consultant from Los Angeles. I'm not kidding. He is rapidly making Carroll County a laughing stock, even as he tries to destroy it for his own profit. Why bring it up indeed? Perhaps because Teabaggers are ignorant, fearful of everything, completely clueless to what's going on in the outside world, and hate anyone who's not one of them. Why bother with Reality, Teabaggers don't deal in it.. The government can already seize your property, it's called eminent domain. And as for "can't do something because of some agreement that they signed with some private group", well, I'll just let the hypocrisy speak for itself TP. 1) Housing Bubble. He got paid $1.8 million dollars. 2) Prescription drug benefit that caused bloated deficit. He got paid $37 million dollars. 3) Susidies for Ethanol industry. He got paid $575K. I used to think Mitt was the #1 flip-flopper but Newt has him beat by a mile. How about looking for your brain, mr Gingrich..If there is such a thing. >>>On the campaign trail in Iowa earlier in the week, Gingrich acknowledged to reporters Agenda 21 is not legally binding. I thought that's what Republicans wanted was to have things left to the local level. But, of course, it is connected to the UN which is another Pavlovian trigger word and requires a vehemently negative response. Gingrich's agenda is to sell books and promote his career as a conservative blowhard. He doesn't really want to be President and he knows that he has too many skeletons in his closet to get elected. Lets qualify something up front, it's not legally binding 'Yet' but once the basic tenants are in place and being used making it legally binding is but short step to making it law. Gotta lay the ground work first, get that camels nose in the tent so the rest of it can follow, quietly and in the dark. What is the world view of those who set the agenda at the un? Is there a conspiracy to shape society in a certain mold to effect a certain outcome. Do these decisions made at the un come into conflict with americas exceptionalism. The question is who should shape whom? America shapes the un or the un shapes america?